I meant to post about this yesterday but then I got busy with trying to re-organize my sewing area - which didn't work at all because I had simply made the mess even messier by pulling everything out of my closet in hopes of sorting it all but then got completely overwhelmed, ditched the mess, and went to cast on a knitting project, thus leaving me to shove everything back into the closet at the end of the day. Hey, I never said I had the best attention span. Anyhoo, I was also busy with casting on new projects for the knit-alongs that I've joined. I know, I know...for those of you who follow me on Instagram you're probably thinking, "wait a minute, didn't she just cast on something new a few days ago?". And to that I say yes, yes I did cast on something new a few days ago, but I'll get to that in a different post. Right now let's concentrate on the knit-along projects. Normally I don't do KALs simply because I'm too fickle of a knitter to actually finish one, especially if the KAL is very specific. LIke say, to knit a certain cardigan or shawl. I know myself too well and know that I'll just end up disappointing myself in the end because I'll most likely cast on something new halfway through the KAL and before I know it, I've completely forgotten all about the project I was suppose to be knitting along with. But if the KAL is quite open, like say, all you had to do was knit with a certain yarn brand in this huge expanse of time, then I can totally do it. So the first KAL that I signed up for was the SweetGeorgia Stash Dive KAL/CAL. The rules: all you have to do is knit with SweetGeorgia Yarns, preferably from your stash (hence the "stash dive" part), and cast on and finish any time between January 15th to April 1st. You can use any base, knit any pattern, and knit as many things as you want. But to qualify for any prizes or bragging rights, you just have to make sure you finish a project in that time frame. Easy peasy, right? I was already planning on knitting a bunch of patterns using SweetGeorgia, so I definitely have this KAL in the bag. Do you have some SGY in the stash that you're just dying to knit up? Or are you already planning on knitting with some SGY? If so, join the KAL!! Sign up and info here. The second KAL I signed up to do is the Ysolda Teague Follow Your Arrow Mystery KAL. I know, I know...what did I just say about overly specific KALs. Well 2 things: this is Ysolda's first ever mystery knit-along (enough said), and I plan on using SGY as my yarn choice which makes this KAL a two-fer since I can also use it for the above KAL (obviously I didn't cast on the shawl on the January 13th start date, I waited until the 15th so that I can still qualify). And since the last clue is emailed out mid-February, there's still plenty of time to finish the shawl. Want to knit Ysolda's shawl too? Check out the details here or check out the official Ravelry group and read up on what others are doing here. The third and final KAL that I joined is the Socks with Sarah KAL. This KAL is right up my alley too. As I've mentioned in this post one of my goals for this year is to always have an active sock WIP on my needles, in the hopes that by the end of the year I'll have a drawer full of lovely hand knits socks. So when Sarah emailed me asking if I would like to join her KAL that encourages you to knit socks every single day this year I thought, hells yeah!! A KAL like that totally makes sense in helping me accomplish my goal, right? I mean, how else am I going to make sure that I stay on track with my sock knitting? Sarah's rules are super relax too: you get to pick which patterns you knit, which level of difficulty you want to do, which yarns you want to use, and how much of the sock to knit up each day. The main thing is that you must participate in sock knitting every day. You can choose to knit an entire sock in a day, or just a section of a sock, or simply knit a few rounds, heck, you can even knit a few stitches if that's all the time you have in your day. The point is to incorporate sock knitting into your every day lives. Very simple, yeah? And I have to admit, this KAL is another two-fer: not only am I going to accomplish my goal in filling up my sock drawer with yummy hand knit socks, but I'm totally going to use SGY so that it can qualify for that first KAL. Bonus!! To make sure I keep up with my daily sock knitting I plan on Instagramming my sock WIPs on a regular basis. So expect to see my Instagram explode with a whole lot of sock action! Do you knit a lot of socks? Do you want to knit a lot of socks? Or do you simply want to join in on the fun of daily sock knitting? If you said yes to any of these questions, join the Socks with Sarah KAL!! 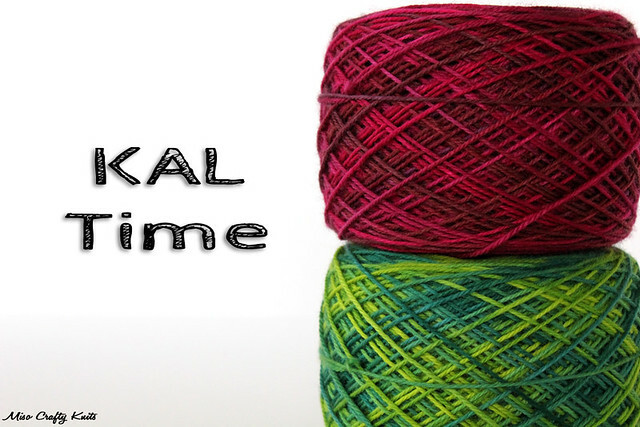 Check out the KAL details here, officially sign up here, check out the Friends of Knitting Sarah group here, or read all about Knitting Sarah here (she's got some awesome posts about sock knitting!!). It's all going to be fun, fun, fun!!! And wow, that's a lot of knitting!! But don't worry, I've got a game plan. I'll let you in on the plan when I iron out the kinks. And after I tell you about my other projects! So, are you planning on joining any KALs? Or are you already involved in one of these? Let me know, that way we can cheer each other on!! Ok, but before I get my knit on, I better sort out my sewing area...I promise I won't cast on anything new!! Oooh Even I could consider such an open KAL - I'm going to consider that Stashdive KAL! DO IT Wendy!!! :D If you're already planning on knitting with SGY and have over 2 months to complete the project, why not?? Plus, you get to finally use up stash or have to use the precious skeins that you're too scared to knit with!! It's a win-win all around type of situation!! Oh geez. I sort of thought I would never join a KAL, but I am already doing a sock one, I have plans for doing a SGY sock too, I have two other socks on the go, but I love doing shawls... so now I want to sign up for all of those. Haha, sorry for the enabling!! (not really!) But it's definitely a nice push to get you to finish projects, and with prizes to be won, it's an even better incentive! How did I miss the Sweet Georgia KAL? And here I almost chose to use one of her yarns for Ysolda's KAL. Clever of you to kill two birds with one stone. April 1st is a long way away-still lots of opportunities! KALs are so much fun and you've chosen to join some really great ones! Looking forward to seeing all your socks as they get knitted up. I like the idea of knitting socks every day, thanks for the KAL tip! I am so joining that sock KAL!! I'm trying to improve my sock knitting this year, I got Socks from the Toe Up from the library and even swatched for gauge!